Autosomal-dominant Alzheimer's disease has provided significant understanding of the pathophysiology of Alzheimer's disease. The present review summarizes clinical, pathological, imaging, biochemical, and molecular studies of autosomal-dominant Alzheimer's disease, highlighting the similarities and differences between the dominantly inherited form of Alzheimer's disease and the more common sporadic form of Alzheimer's disease. Current developments in autosomal-dominant Alzheimer's disease are presented, including the international Dominantly Inherited Alzheimer Network and this network's initiative for clinical trials. Clinical trials in autosomal-dominant Alzheimer's disease may test the amyloid hypothesis, determine the timing of treatment, and lead the way to Alzheimer's disease prevention. Alzheimer's disease (AD) afflicts an estimated 24 million people in the world, with an expected increase to over 80 million people by the year 2040 . AD causes an insidious and progressive loss of cognitive function and independence, taking a heavy personal and financial toll on the patient and the family. Because of the severity and increasing prevalence of the disease in the population, it is urgent that better treatments be developed. The only identified deterministic factors for the development of AD are the presence of mutations in one of three genes - amyloid precursor protein (APP), presenilin 1 (PSEN1) or presenilin 2 (PSEN2) - or duplication of APP. Approximately 50% of people from these kindreds are mutation carriers destined to develop dementia of the Alzheimer's type, generally at an early age (~30 to 50 years). In the present review, we define autosomal-dominant Alzheimer's disease (ADAD) as dominantly inherited AD with pathological confirmation. Other terms, such as familial AD and early-onset AD, may encompass ADAD, but may also include AD from nondominant causes such as the apolipoprotein E4 allele or sporadic Alzheimer's disease (SAD). Although ADAD represents fewer than 1% of all AD cases, it is a critically important area of study because the pathological features of the disease are similar to the more common sporadic form, because causative mutations have known biochemical consequences that are believed to underlie the much more prevalent sporadic form of the disease, and because it is possible to identify and study presymptomatic individuals decades before they are destined to develop clinical disease. The opportunity to determine the sequence of biomarker changes in presymptomatic gene carriers who are destined to develop AD is likely to reveal critical information about the pathobiological cascade that culminates in symptomatic disease. The realization that AD is a major and growing public health problem with aging populations has added urgency to the search for improved therapeutics. Many proposed treatments for AD currently target slowing or halting of the underlying disease (that is, putative disease-modifying interventions), but they are not likely to reverse the extensive neuronal death already present at the onset of symptoms. For individuals and families at risk for ADAD, such interventions have the potential to delay or even prevent dementia in asymptomatic individuals, in addition to slowing progression in those with symptoms. These at-risk individuals offer a potential proof of concept for presymptomatic disease modification, with implications for AD more generally. ADAD families have provided important insights into the pathogenesis of AD in the past several decades. Discovery of human genetic mutations has facilitated the development of the transgenic animal models used in AD research today. Knowledge of the molecular mechanisms of the identified mutations has catalyzed identification of the causative pathogenic events in AD in humans. Indeed, this avenue of research has provided the most compelling case for a unifying theory of AD. In addition to contributing to advances in the basic scientific understanding of AD, ADAD families represent an ideal population for preventative and treatment trials for several reasons. First, there is near certainty (~100%) regarding development of the disease with a known mutation that enables prevention studies and increases the power of treating minimally or presymptomatic patients. Second, the approximate age at which symptoms are likely to develop can be predicted in individuals who are completely asymptomatic, allowing therapeutic trials years or decades before clinical onset. Finally, ADAD research participants are highly motivated, relatively young, and have minimal co-morbidities. By engaging those at risk for ADAD, uniquely informative scientific information about disease progression, biomarkers and changes due to therapeutic treatments are expected to lead to advancements in drug development. Disease-modifying therapeutics have been largely developed with animal models based on human disease-causing mutations. ADAD caused by known mutations most closely resembles those models, and therefore is more likely to respond to disease-modifying treatments. Results from treatment trials in ADAD will bridge cellular and mouse therapeutic research with SAD therapeutic research. Because the clinical and pathological phenotypes of ADAD are similar to the more common late-onset AD, drugs that prove successful in the prevention or delay of dementia for ADAD are likely to provide guidance for future prevention and disease modification in late-onset AD. Successful implementation of prevention and symptomatic studies will therefore inform about the causes of AD and will provide guidance for future therapeutic development. In the present review, we present historical and current information about ADAD, including: discovery of the genetic mutations; clinical, pathological, imaging and biomarker findings; the explosion of understanding about AD based on basic science studies of genetic mutations and development of AD animal models from the mutations; and an international multicenter effort to understand the cascade of events leading to AD toward future trials to treat - and even prevent - the onset of dementia in those with mutations. Provocative supportive evidence indicates that Dr Alois Alzheimer's first case may have been ADAD. This case (August D), described in 1906, was early onset, possibly familial, and from a region of Germany associated with the PSEN2 Volga-German mutation . The first documented cases of familial AD were identified in early-onset dementia with pathological confirmation [3, 4]. Other notable early studies identified pedigrees in which more than 10 individuals over five generations were affected by early-onset AD . Affected individuals developed symptoms before age 60 with progressive amnesia and other signs of cortical cognitive impairment as seen in late-onset SAD . Neuropathological examination of these early cases demonstrated extensive amyloid and neurofibrillary pathology with neuronal loss and gliosis. In 1963, a case series with early-onset AD in 11 of 26 children with an affected parent and no affected individuals in the pedigree without an affected parent developing the disease suggested that early-onset AD was the result of a fully penetrant autosomal-dominant mutation . The search for a dominant mutation focused on chromosome 21, due to the Alzheimer's-like pathology seen in older patients with Down syndrome (trisomy 21). In 1987, a genetic linkage study in four large ADAD families found a gene locus at 21q11.2 to 21q22.2, but not in the 21q22 region associated with the Down syndrome phenotype . Then, in 1991, a missense point mutation (Val-Ile) at codon position 717 was discovered in the APP gene in a single family with linkage to chromosome 21 . This report identified the specific mutation in this family and provided a possible mechanistic link between the APP mutations and abnormalities in amyloid processing seen in these families. Most of the variants in APP occur between residues 714 and 717 near the putative site for γ-secretase cleavage . At least 38 additional ADAD APP mutations have since been identified. One year after the discovery of mutations in APP as a cause of ADAD, four different laboratories identified another locus for ADAD on 14q24 [11–14]. The gene PSEN1 was cloned 3 years later, encoding the protein presenilin 1 . Presenilin 1 is a highly conserved membrane protein required for γ-secretase to produce amyloid-beta (Aβ) from APP . Since the initial finding of the PSEN1 mutation, approximately 180 different mutations that cause ADAD have been identified http://www.molgen.ua.ac.be/ADMutations/. Within a year of cloning PSEN1, a gene with substantial nucleotide and amino-acid homology was discovered on the long arm of chromosome 1 in two families . This gene, PSEN2, appears to account for only a small percentage of ADAD cases and may be associated with a later age of onset and slower disease progression than mutations in PSEN1 and APP. The discovery of the genetic causes of ADAD catalyzed research on the relationship of ADAD to SAD. The clinical, imaging, pathologic and biochemical relationships have been individually described by groups around the world, each following a relatively small number of affected families. While the pathogenic cause of ADAD is an inherited mutation, the molecular pathogenic causes of SAD have not yet been identified. Therefore, although the two forms of the disease may have fundamentally different initial pathways, they share a remarkably similar pathophysiology. These descriptions have provided key insights into the causes of both SAD and ADAD. The characteristics of ADAD compared with the more common sporadic late-onset AD are summarized in Table 1. Aβ, amyloid-beta; ADAD, autosomal-dominant Alzheimer's disease; CAA, cerebral amyloid angiopathy; CSF, cerebrospinal fluid; FDG, fluorodeoxyglucose; MRI, magnetic resonance imaging; PET, positron emission tomography; PiB, Pittsburgh Compound B; SAD, sporadic Alzheimer's disease. In broad terms, the clinical presentation of ADAD is very similar to that of SAD. Like SAD, most ADAD cases present with an insidious onset of episodic memory difficulties followed by inexorable progression of cortical cognitive deficits. The most obvious difference between familial and sporadic cases of AD is the younger age at onset in individuals with ADAD mutations. The youngest ages at onset are with PSEN1 mutations; symptoms typically first appear between the ages of 30 and 50 years, but some families have individuals affected in their 20 s . APP pedigrees tend to have a later age at onset, typically in the 50 s and ranging from 45 to 60 years old. The rarer PSEN2 mutations have a wide range of onset with some relatively late-onset cases. Overall survival in ADAD is similar to that of SAD, with the caveat that survival length in very elderly sporadic individuals tends to be lower. If younger onset (< 65 years old), and therefore healthier, sporadic cases are compared with ADAD individuals, their survival is not very different. PSEN1 mutation carriers may have slightly shorter survival. Comparisons of disease duration are notoriously difficult, particularly as recognition of the onset of problems may be earlier in familial individuals who are aware of their at-risk status - particularly those enrolled in longitudinal studies. The majority of ADAD cases have an amnestic presentation very similar to that seen in sporadic disease, with the first deficits being in visual and verbal recall and recognition. Longitudinal studies of unaffected at-risk individuals have suggested that the earliest neuropsychometric findings involve a fall in verbal memory and performance IQ scores , with relatively preserved naming . Atypical language and behavioral presentations occur in a minority of both sporadic and familial cases. Neurological signs and symptoms appear to be more common in ADAD. Myoclonus and seizures are both relatively more frequent; myoclonus may be a harbinger of later seizures. A number of PSEN1 mutations are variably associated with a spastic paraparesis (and characteristic histopathology) and extrapyramidal and cerebellar signs. APP mutations that cluster within the Aβ coding domain around positions 692 to 694 do tend to have a phenotype that is different to sporadic disease - cerebral hemorrhage is a characteristic feature probably related to extensive amyloid angiopathy. Amyloid angiopathy and seizures are also a feature of the APP duplication pedigrees . Apart from some mutation-specific exceptions and the earlier age at onset, ADAD is remarkably similar to SAD, with as yet unexplained heterogeneity being a feature of both forms of the disease. The principal neuropathological changes in ADAD - neuronal loss, neurofibrillary tangles, senile plaques, and cerebral amyloid angiopathy (CAA) - mirror those seen in SAD, providing strong support for ADAD as a model for studying AD (Figure 1). In vitro and in vivo studies have shown that dominant mutations frequently increase Aβ42 and Aβ40 deposition and alter the Aβ42/Aβ40 ratio . Postmortem studies confirmed elevated levels of brain Aβ42 in persons with APP mutations compared with SAD . APP mutations increase Aβ production by different mechanisms. Mutations adjacent to the β-secretase cleavage site increase cleavage by β-secretase, generating increased Aβ40 and Aβ42 from APP . APP mutations around the γ-secretase cleavage sites result in modification of γ-secretase activity, enhancing only the production of Aβ42 . PSEN1 and PSEN2 mutations alter the conformation of the γ-secretase complex, increasing production of Aβ42 from APP . Postmortem studies have shown that PSEN1 and PSEN2 mutations are related to increased levels of insoluble Aβ42, and to a lesser extent insoluble Aβ40, compared with SAD [25–28]. A comparable Aβ42/Aβ40 ratio between SAD and PSEN mutations has also been reported [29, 30], although other research has reported a significantly increased Aβ42/Aβ40 ratio in PSEN1 and PSEN2 mutations when compared with SAD, primarily due to higher levels of Aβ42 . Principal neuropathological changes in autosomal-dominant Alzheimer's disease. 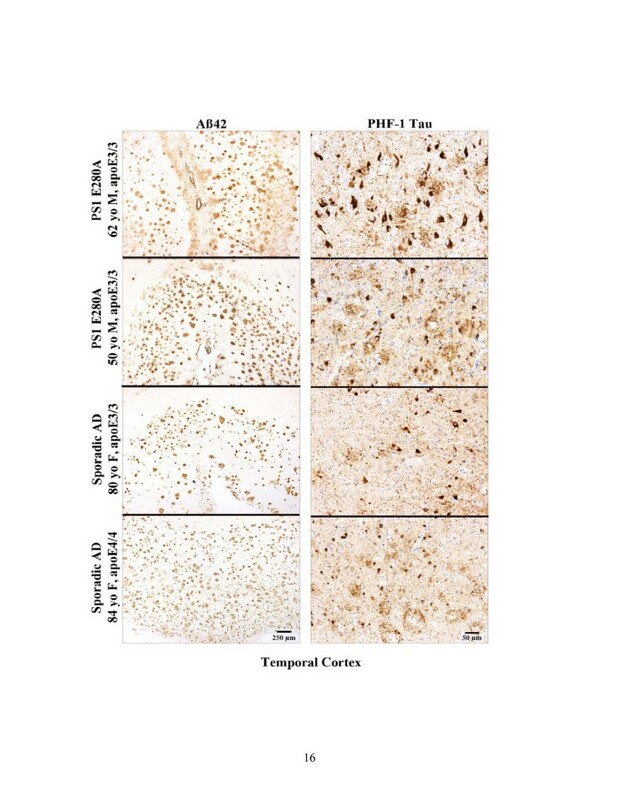 Sections showing amyloid-beta (Aβ)42 and PHF-1 tau detection (top to bottom): presenilin 1 (PS1) E280A (male, 62 years old, disease duration 8 years, apolipoprotein E3/3); PS1 E280A (male, 50 years old, disease duration 5 years, apolipoprotein E3/3); sporadic Alzheimer's disease (SAD) (female, 80 years old, disease duration 7 years, apolipoprotein E3/3); SAD (female, 84 years old, disease duration 13 years, apolipoprotein E4/4). All brain tissues were routinely fixed in formalin and were paraffin-embedded. Sections were 12 μm thick. Aβ42 was detected using polyclonal antibody C42 (with formic acid pretreatment), kindly provided by Dr Takaomi Saido (RIKEN Brain Science Institute, Tokyo, Japan). PHF-1 tau was detected using PHF-1 monoclonal antibody (with microwave pretreatment), kindly provided by Dr Peter Davies (Feinstein Institute of Medical Research, New York, USA). Distinctive neuropathological features are found in some pathology case reports and may be related to mutation type. These variant pathologies may affect the pharmacological response, tolerability, and biomarker measurements of experimental agents in clinical trials into SAD. These include cottonwool plaques, severe CAA, intracerebral hemorrhage, cerebellar plaques, and Lewy bodies. Cottonwool plaques are large, ball-like plaques lacking dense amyloid cores that have been reported with PSEN1 mutations, especially in mutations beyond codon 200 . Cottonwool plaques have been associated with spastic paraparesis and seizures . CAA is common in SAD, but may be more prominent with specific ADAD mutations. The Dutch, Flemish, and British APP mutations occurring within the Aβ coding region typically feature severe CAA, with intracerebral hemorrhage occurring in persons with the Dutch mutation. Larger and denser Aβ deposits around vessels or ring-like plaques staining for Aβ42 instead of Aβ40 have been reported with some APP mutations compared with SAD [33, 34]. PSEN1 mutations after codon 200 show a higher incidence of severe CAA compared with SAD . Cerebellar plaques with the British APP and some PSEN1 mutations have been reported . Lewy body pathology has been reported in the amygdala and neocortex with some PSEN1 and PSEN2 mutations , as has been reported in SAD. Variability in phenotypic and pathological expression has been reported within families, suggesting that genetic or epigenetic factors might be exerting disease-modifying effects . A growing number of neuroimaging studies have demonstrated evidence of early alterations in brain structure and function in carriers of autosomal-dominant mutations prior to the onset of clinical dementia. Early magnetic resonance imaging (MRI) studies demonstrated that hippocampal atrophy was present in presymptomatic and early symptomatic carriers, which paralleled the development of verbal or visual memory deficits, in a pattern similar to that seen in SAD . More severe medial-temporal lobe atrophy may be present in symptomatic ADAD carriers compared with SAD . Gray-matter regional volume loss and decreases in magnetization transfer ratio have also been reported in mildly symptomatic carriers . Longitudinal structural imaging studies have demonstrated an accelerated course of atrophy compared with SAD, in both regional-medial temporal lobe and whole-brain measures [39–41] and in cortical thinning, particularly evident in the precuneus and posterior cingulate prior to the diagnosis of dementia . Alterations in white matter structure have also been demonstrated in presymptomatic and early symptomatic carriers, with decreased fractional anisotropy in the fornix and widespread areas of brain visualized with diffusion tensor imaging . Presymptomatic alterations in brain perfusion and metabolism, similar to the patterns reported in SAD, have also been reported among ADAD carriers using nuclear medicine techniques, including single photon emission tomography [44, 45] and positron emission tomography (PET) [46, 47]. One study demonstrated early glucose fluorodeoxyglucose-PET hypometabolism in the posterior cingulate cortices, hippocampus and entorhinal cortices of presymptomatic carriers of ADAD mutations, which was present prior to significant atrophy in these regions . Functional MRI techniques have demonstrated alterations in hippocampal activity during episodic memory tasks in presymptomatic ADAD carriers that appear to occur decades prior to dementia , similar to the observations in young apolipoprotein E ε4 carriers [50, 51], however, this observation was not replicated in a larger population of ADAD mutation carriers in a study employing an implicit novelty encoding paradigm . More recently, PET amyloid imaging studies with Pittsburgh Compound B (PiB) have revealed evidence of fibrillar Aβ deposition in ADAD, including carriers who were up to 10 years younger than the age of onset for their family [53–55]. Interestingly, these studies have consistently reported elevated levels of PiB retention in the striatum of presymptomatic ADAD individuals, which occurs more variably in late-onset SAD. The biochemical changes in the brain, cerebrospinal fluid (CSF) and blood of persons with AD have been described in detail over the past 30 years. Many biochemical changes in the brain have been documented to occur in the AD process, with those biomarkers associated with amyloid plaques and neurofibrillary tangles being specific for pathologically defined AD [6, 56]. The identification of Aβ as the major component of CAA  and amyloid deposits in plaques  was followed by the finding that tau is the major component of neurofibrillary tangles. In addition to AD-specific protein deposition, biochemical changes in synaptic, inflammatory, oxidative, and cell cycle markers occur in the AD brain . Multiple groups have reported that CSF Aβ42 in ADAD participants is reduced to approximately one-half of normal values [60, 61], a finding remarkably similar to SAD [62, 63]. While decreased Aβ42 appears to have remarkable specificity for pathologic AD and Aβ amyloidosis in the brain , CSF Aβ40 is not consistently different in AD individuals compared with normal individuals. CSF tau and phospho-tau levels are increased almost two-fold in ADAD individuals compared with controls [60, 61], again mimicking the CSF profile in lateronset SAD. The relative age at which CSF biomarker changes occur in ADAD has not yet been adequately characterized, although it appears to predate clinical symptoms. Increases in plasma Aβ42 have been consistently found in ADAD, while there is little, if any, consistently reported difference in SAD [65–67]. Other blood-based biomarkers have not yet reproducibly differentiated ADAD or SAD from controls. 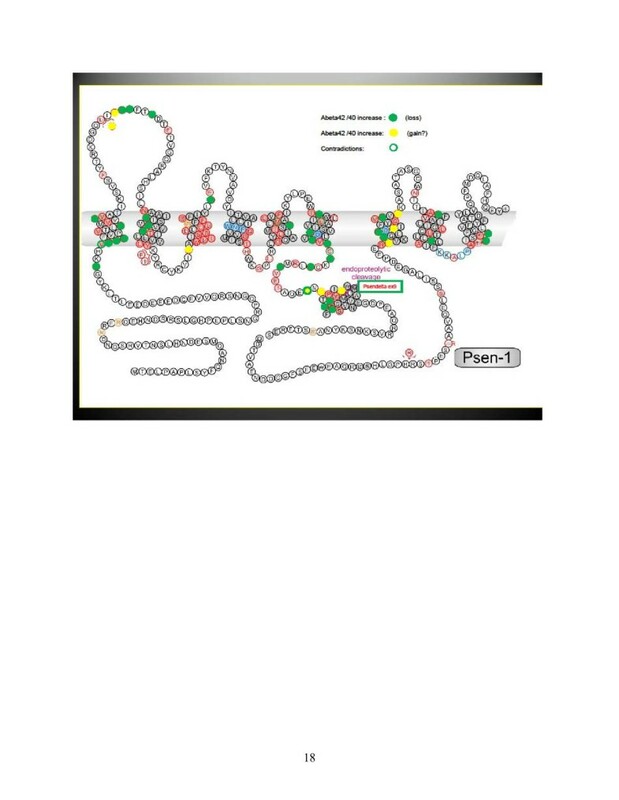 Identification of mutations in the substrate APP as well as in the proteases PSEN1 and PSEN2 that cleave APP to produce Aβ peptides provides very strong support for the amyloid hypothesis in AD . The mutations in the APP gene are clustered around the three cleavage sites (Figure 2). Only one mutation (the Swedish mutation) increases Aβ generation by increasing β-secretase processing of APP. Most of the other mutations affect the biophysical properties of the Aβ peptide and have a diverse array of effects, but, as indicated in Figure 2 they consistently increase the toxic amyloid potential of the protein, thereby increasing the tendency of Aβ to oligomerize. This is particularly clear for the most abundant mutations affecting the γ-secretase cleavage sites, which all result in the generation of the longer Aβ42 peptide. The rationale for therapeutic strategies that target decreasing the Aβ generated from the APP protein in these families is obviously strong, and β-secretase or γ-secretase inhibitors are predicted to work as they act on the enzymes and not on the APP substrate . For immunization strategies, APP mutations in the Aβ sequence may or may not interfere with the binding of particular antibodies. Overview of dominantly inherited mutations in the amyloid precursor protein. Amyloid precursor protein (APP) is a type I integral membrane protein inserted in the cell membrane (upper part). The APP mutations are all clustered in or around the amyloid-beta (Aβ) peptide sequence, and this region is therefore displayed enlarged using the single amino acid code. White circles, mutations found; red font, resulting amino acid substitutions. Mutations cluster around the α-secretase, β-secretase and γ-secretase sites as indicated. They have various effects on the generation of Aβ as indicated, but their overall effect is an increased tendency to generate toxic species. In contrast to the localized APP mutations, the presenilin mutations are scattered throughout the presenilin protein, although most are clustered along the different transmembrane domains in the hydrophobic core of the protein (Figure 3). Functionally, most presenilin mutations cause a loss of function of γ-secretase activity; that is, they reduce the cleavage rate of the different substrates of the enzyme . Pathologically, they most probably operate in a similar way as the APP mutations by enhancing the toxic amyloid potential of the residual Aβ peptides that are generated by the mutated presenilin/γ-secretase. Indeed, although many mutations lower Aβ40 production, almost all mutations increase or at least do not affect the production of the Aβ42 peptide . The overall result is a change in the Aβ42:Aβ40 ratio, which increases the tendency to form toxic oligomeric species . Overview of dominantly inherited mutations in presenilin 1. Presenilin contains nine transmembrane domains. The presenilin 1 mutations (red circles) are scattered over the protein, but most are in the hydrophobic domains of the protein. Green and yellow circles indicate whether the effect of the mutation on amyloid-beta (Aβ) production has been investigated: green, mutations that decrease Aβ40 production; yellow, mutations that increase Aβ42 production. In all cases, an increase of the Aβ42/Aβ40 ratio has been found. γ-Secretase inhibitors may have less effect on mutated γ-secretase than on wild-type γ-secretase [73–75]. In preparation for treatment trials, individual mutations can be tested in vitro for γ- secretase inhibitor effects on γ-secretase activity. While it is likely that lowering the total burden of Aβ peptide might be beneficial, caution is needed because it is possible that some γ-secretase inhibitors could block mainly the wild-type γ-secretase while the mutant presenilin remains operational. β-Secretase inhibitors or vaccination against Aβ avoid this particular issue as they target the wild-type β-secretase or the wild-type Aβ. The creation of AD animal models was crucial to the development of modern anti-amyloid therapeutic programs. Initial efforts to develop an AD model focused on transgenic mice overexpressing human APP, since no naturally occurring animal models fully recapitulate all of the pathological and functional deficits in AD. Over-expression of the wild-type APP was insufficient to cause a relevant phenotype. With the discovery of the familial APP mutations, however, several animal models using the Swedish, London, Indiana and other mutations have been developed and characterized. Most of these mouse models show consistent amyloid pathology, but often there is poor correlation between the development of morphological brain changes of deposition of amyloid plaques and disturbances in learning and memory function. Mouse models with only presenilin 1 or presenilin 2 mutations have been developed, but they do not develop amyloid pathology in spite of increased production of Aβ42 [76, 77]. The inability of presenilin mutations to cause amyloid pathology in mice is most probably due to the sequence differences of mouse APP compared with human APP, as murine Aβ peptides are less prone to aggregation. Accelerated brain pathology was achieved by combining the genetic liability of human APP mutations with presenilin mutations . In addition, the behavioral disturbances are more pronounced in these bigenic animals . Transgenic models of ADAD are quite different from human models because of species differences and the location and increased amount of expression of the mutated protein. Transgenic models can be useful for drug development, however, because they develop amyloidosis and express altered Aβ peptides similar to human carriers of the mutation. Therapies that show pathological efficacy should therefore also be able to exhibit similar activity in humans; for example, decreasing overall amyloid peptides and normalizing the Aβ42:Aβ40 ratio. Because most of the treatments currently in clinical trials have been developed in mice carrying an ADAD mutation, they are likely to be more effective in ADAD compared with SAD. Finally, although all of the mouse models demonstrate disturbances of amyloid production and metabolism, they are not full models of AD. Conclusions about the therapeutic efficacy of drugs tested in mouse models must therefore be made cautiously. 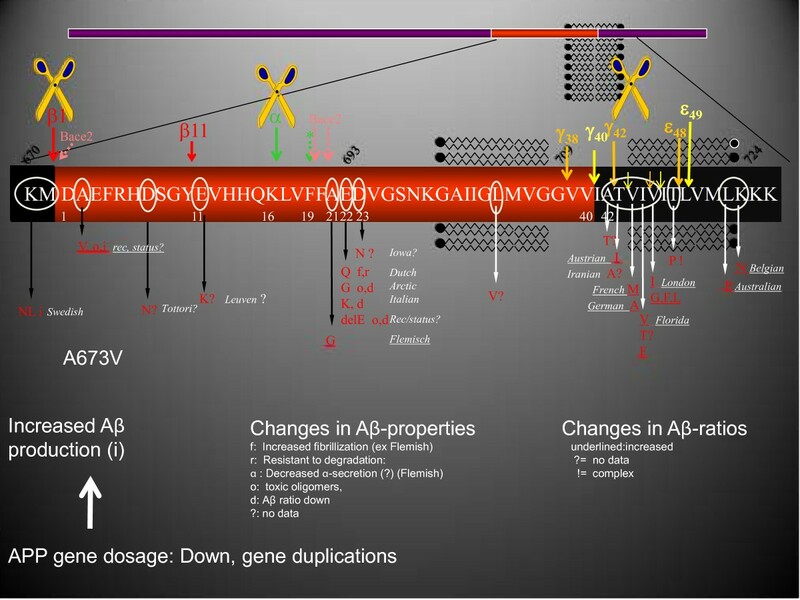 Current trials for the common form of AD include approaches to target Aβ by decreasing production [80, 81], increasing clearance [82–84], and other attempts to ameliorate the toxic effects of the amyloid cascade. Alternative targets at various stages of drug development include tau, inflammation, neurotransmitter modulators, and other approaches. The diverse approach to drug discovery in AD is helpful for the field, as there has not yet been a successful disease modification trial. Reasons cited for the lack of clinical trial success over the past decade include inadequate preclinical models, few trials completing phase III studies, few studies with demonstrated pharmacodynamic activity, treating the disease process too late in the disease course, or targeting an insignificant mechanism. Treatment trials in ADAD provide an opportunity to address several of these concerns of treating too little, too late - with designs that demonstrate target engagement followed by prevention studies to alter the course of changes that occur in the disease process. Despite the opportunity for prevention studies in persons destined to develop AD because of ADAD mutations, we are aware of only one such study being performed . Six presymptomatic known PSEN1 mutation carriers are being treated in an open-label fashion with HMG-CoA reductase inhibitors (either atorvastatin or simvastatin). In addition to cognitive outcome measures, CSF indices (Aβ42, tau, p-tau181, sAPPα, and sAPPβ) are being obtained. In a preliminary report, a lowering of CSF sAPPα and sAPPβ associated with HMG-CoA reductase inhibitors was observed in PSEN1 mutation carriers without an effect on Aβ42, tau, or p-tau181. Although small in scale, this biomarker study represents an important initial step towards larger efforts to explore preventative interventions in ADAD. Owing to the geographically dispersed nature of ADAD families and the relative rarity of the disease, an international network of research centers has been established by the National Institute on Aging to adequately power studies in this uniquely informative population. This network, formally known as the Dominantly Inherited Alzheimer's Network (DIAN), will enable international longitudinal studies of persons with dominantly inherited mutations that cause AD. This is the first large-scale, multicenter, systematic effort to use standardized instruments to identify and uniformly evaluate individuals with dominantly inherited AD. The DIAN aims to determine the chronological changes in cognition and biomarkers in relation to clinical onset and progression of dementia in a well-characterized and uniformly studied group of persons at risk for ADAD. The DIAN investigators will assess and quantify the ability of clinical, biological and imaging markers to predict and track the progression of AD. The DIAN's overriding purpose is to contribute to the search for meaningful therapies for AD by helping elucidate the cascade of events that lead to dementia of the Alzheimer's type. The specific aims for the DIAN include the following. First, to establish an international registry of individuals (mutation carriers and noncarriers; presymptomatic and symptomatic) who are biological adult children of a parent with a known causative mutation for AD in the APP, PSEN1, or PSEN2 genes in which the individuals are evaluated in a uniform manner at entry and longitudinally thereafter. The second aim is to obtain clinical and cognitive batteries that comprise the Uniform Data Set of the National Institutes of Health-funded Alzheimer's Disease Centers, supplemented by web-based neuropsychological tests. A further aim is to implement structural, functional, and amyloid imaging protocols (3T MRI, fluorodeoxyglucose-PET, PiB-PET). The fourth aim is to collect biological fluids, including blood and CSF, for DNA analysis and assays of putative biomarkers of AD, including Aβ42 and tau - this will also provide a resource for exploratory studies of novel biochemical markers. Finally, the DIAN aims to perform uniform histopathological examination of cerebral tissue in individuals who come to autopsy. The National Institute on Aging awarded a 6-year grant for the DIAN that funds 10 international performance sites that combine resources and research participants of the individual sites in a uniform and comprehensive manner. Currently, over 400 individuals who are members of families with a known causative mutation for AD (that is, APP, PSEN1, PSEN2) have been identified between the sites and are eligible for participation in the DIAN. Over the first 6 years, sites will recruit, enroll and evaluate these individuals to reach a sample size of 400 participants. The DIAN cohort is predicted to comprise 80% asymptomatic individuals (with 50% of these being mutation carriers and 50% noncarriers) and 20% symptomatic individuals. Based on the participant population demographics, the DIAN is expected to enroll 50% of individuals within 3 years of parental age at disease onset, and 30% of individuals within 3 to 10 years before parental age at disease onset. The DIAN participants will thus consist of approximately 160 asymptomatic mutation carriers, 80 symptomatic AD mutation carriers, and 160 mutation-negative sibling controls. Data obtained through the DIAN will be used in the design and statistical powering of prevention and treatment studies in ADAD. Additionally, white blood cells are being stored at the National Cell Repository for Alzheimer's Disease to establish immortalized lymphoblastoid cell lines for use in a variety of investigations, including in vitro studies to characterize the pharmacodynamic properties of putative anti-AD agents and their applicability in both ADAD and SAD. The DIAN will also provide the infrastructure for the recruitment and retention of subjects, which is critical for the successful performance of clinical trials in this rare, widely dispersed, and informative population. An additional scientific aim for the DIAN is to evaluate potential disease-modifying compounds for the treatment of AD. To this end, the DIAN formed a Clinical Trials Committee to direct the design and management of interventional therapeutic trials of DIAN participants. The committee will assist in the design and implementation of trials that have the highest likelihood of success while providing advancement of treatments, scientific understanding and clinical effects of proposed therapies. Specifically, the committee's aims are to evaluate trial designs to determine the impact of interventions on biomarker, cognitive, and clinical measures in ADAD, to determine which therapeutic targets are most amenable to treatment at different stages of AD, and to test the hypotheses for the causes of AD (for example, amyloid hypothesis) through therapeutic treatment trials. Testing interventions for the prevention of AD in presymptomatic persons with inherited ADAD mutations offers potential for medical and scientific advances, but also presents a number of challenges - ethically, scientifically, and logistically. ADAD participants tend to be highly motivated for research, perhaps due in large part to altruism. That is, they frequently express the hope that even if their participation does not benefit themselves, perhaps it will benefit their family members, including their progeny. One key design challenge is the fact that most individuals at risk of carrying an ADAD mutation have not chosen to have genetic testing. In a clinical series of 251 persons at risk for ADAD or frontotemporal lobar degeneration due to mutations in the MAPT gene, only 8.4% requested such testing . The DIAN investigators aim to explore disease-modifying treatments in ADAD mutation carriers. The ultimate goal is to postpone or prevent the onset of AD symptoms, or to slow the progression of symptoms. The limited number of potential participants, however, limits the feasibility of trials with traditional cognitive or clinical outcomes. The DIAN will pursue a strategy of assessing the impact of putative disease-modifying treatments on biomarkers of AD in combination with sensitive measures of cognition. Candidate biomarkers include molecular imaging (amyloid PET scanning), functional imaging (fluorodeoxyglucose-PET) and structural imaging (volumetric MRI measures), as well as biochemical measures in CSF (for example, tau, phospho-tau and Aβ42). Although no biomarker has been validated as a surrogate outcome for regulatory purposes, these biomarkers represent plausible candidate surrogate outcomes being pursued by AD trialists. The rationale for accepting surrogate markers with cognitive improvements as viable endpoints is compelling in this genetically determined population. As the number of preventative studies that might be performed in persons carrying familial AD mutations will be limited, the optimum choice of intervention is critical. Medications that prevent neurodegeneration by targeting the causative mechanisms are ideal as they might both prevent the development of pathology and slow progression after onset. Active or passive immunotherapy or γ-secretase or β- secretase inhibitors may fulfill these criteria. Potential hazards include complications related to established amyloid angiopathy (for example, vasogenic edema), which may be increased in some ADAD mutations, teratogenicity, and other unknown risks of chronic exposure. As only a minority of presymptomatic persons at risk for ADAD mutations asks to know their genetic status, enrollment of mutation carriers into prevention studies presents a challenge. The availability of treatment trials will undoubtedly influence the decision to obtain genetic testing. If genetic testing is required for a treatment trial, participants will need to consider testing for mutation status in order to participate in a study in which they may receive a medication (or placebo) that may help prevent the illness but could also have significant side effects. An alternative approach would be to open enrollment to all persons at risk, to not report genetic testing, and to only randomize active drug to mutation carriers with noncarriers receiving blinded placebo. In such a study, the occurrence of side effects might unblind participants to their treatment group and therefore to their mutation status. Informed consent for such a trial would need the equivalent of presymptomatic genetic counseling for this possibility. The gold standard for demonstrating efficacy of an intervention is the prospective randomized, blinded, placebo-controlled study. Additionally, studies might be designed that feature open-label extensions after a prespecified time period and/or a clinical endpoint is reached (such as diagnosis of dementia). Well-established AD biomarkers, including CSF, PiB, and MRI markers, can be used as endpoints in clinical trials on DIAN presymptomatic mutation carriers. The objective of such trials is to determine the efficacy of novel treatments in altering the rate of change among these biomarkers. In addition, cognitive and global function measures (for example, Clinical Dementia Rating sum of boxes) can be used in clinical trials on DIAN symptomatic participants. Given the potential heterogeneity of the population, baseline co-variants may be critical to maximize efficiency. In a prevention trial of presymptomatic ADAD participants, sensitive cognitive measures may be used in combination with biomarker changes. Alternatively, the time to the onset of mild cognitive impairment or AD can be reasonably used as an efficacy endpoint, especially if participants are chosen with appropriate estimates of their age of onset so that enough participants will develop AD during the designed length of follow-up to satisfy the statistical power requirement. The high-risk period immediately before clinical and cognitive decline can be determined by the use of biomarkers together with family history and age. The ongoing DIAN longitudinal study provides important baseline and rate of change data for clinical, cognitive, imaging and other biomarkers. These data will increase the ability to power and design clinical trials, and will also provide a pretreatment rate of change for analysis of treatment effects. In general, an increase of either the study duration or the frequency and precision of repeated measures will decrease the within-subject variability and will improve the precision of parameter estimates or statistical power over time . In prevention trials in presymptomatic DIAN participants, the duration of the trial as well as the age window of participants relative to their parents' age of disease onset is crucial to allow for adequate biomarker and cognitive change to be detected. Plans for initial DIAN therapeutic trials include identifying optimal anti-amyloid candidate interventions in development. If indicated, the suitability of specific candidate agents may be first assessed with shortduration cerebrospinal fluid biomarker studies to confirm target engagement. The study population may include all participants at risk, or a subset with more imminent risk as suggested by biomarkers or expected age of onset; both symptomatic and presymptomatic individuals may be included. Study designs that may be implemented include randomized controlled trials with parallel group designs, lasting approximately 2 years. After completion of the placebo-controlled period, all participants can be offered open-label treatment with continued regular assessments. The primary outcome measure may be a change in amyloid PET signal; this measure provides adequate power to demonstrate a treatment effect with group sizes of only 20 to 30 participants , and allows a clinically heterogeneous study population. Secondary outcomes would include other imaging and biochemical biomarkers, as well as cognitive and clinical assessments. A historical precedent highlights what is possible in the approach to prevent end organ damage by early intervention. Although there are challenges in designing and implementing presymptomatic treatment trials for an early-onset genetic disease, we are encouraged by similar successful trials in vascular disease. The first clinical improvement in statin treatment for hypercholesterolemia was demonstrated in familial hypercholesterolemia, a genetic, early-onset aggressive form of the more common later-onset hypercholesterolemia that ultimately leads to myocardial infarction and stroke . After 4 to 8 weeks of treatment with mevastatin, patients with familial hypercholesterolemia demonstrated resolving vascular bruits and disappearance of tendonous xanthomas . Further, treatment with mevastatin decreased cholesterol levels in familial hypercholesterolemia patients as well as in nonfamilial hyperlipidemic patients. Taken together, these observations provided the first biological evidence of a direct effect of a statin on cholesterol metabolism and clinical findings. These early biomarker studies heralded the future success of a class of anti-cholesterol drugs called statins in reducing heart attacks and strokes for millions of patients worldwide. So too may studies of anti-amyloid treatments in ADAD also lead to breakthroughs that allow for highly effective therapies against SAD. Therapeutic trials in ADAD are highly likely to produce critical scientific information, test fundamental theories, bridge basic science with clinical trials, accelerate therapeutic development for SAD and, perhaps most importantly, offer a chance for ADAD mutation carriers to improve their lives and their children's lives. Randall J Bateman, Paul S Aisen, Nick C Fox, John M Ringman, Stephen Salloway, Reisa A Sperling and Chengjie Xiong contributed equally to this work. The authors are grateful to the participants for their time and effort in contributing to the body of knowledge reviewed. The present work was supported by grants from the US National Institutes of Health grants U-01 AG032438 and also grants from an anonymous foundation. NCF is supported by the UK National Institute for Health Research and Medical Research Council. BDS is supported by a Methusalem grant from the Flanders government and the KULeuven. The authors thank Karen Dodson for her insightful editing of the manuscript. BDS is a consultant for Janssen Pharmaceutica, Beerse, Envivo Pharmaceuticals, Boston and Remynd NV, Leuven. He also receives research funding from Janssen Pharmaceutica, Beerse. RAS has consulted for Janssen, Pfizer, Elan, Bayer, Bristol-Myers-Squibb. The authors declare no other competing interests.